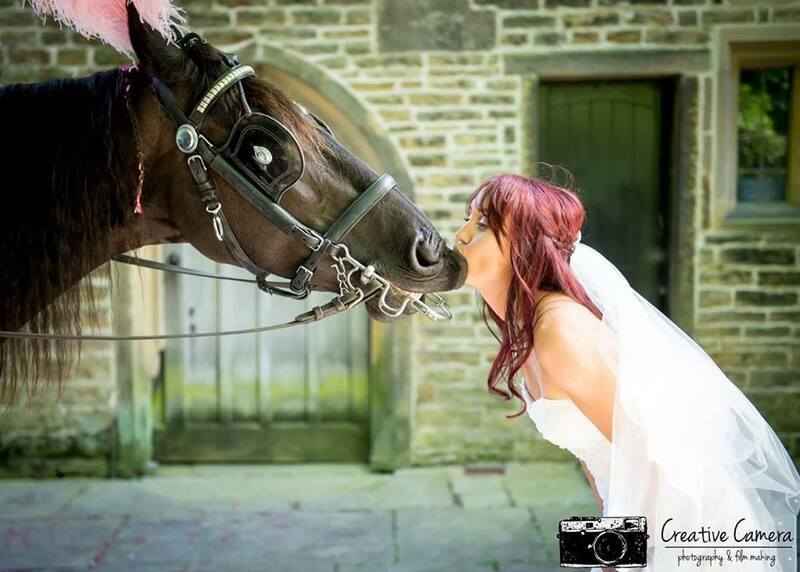 Since founded in 1980, Elegant Carriages have grown to be the largest providers of horse-drawn carriage hire in the North West. From our central location in Chorley, we can service across Lancashire, Cheshire and Merseyside, travelling further if required. 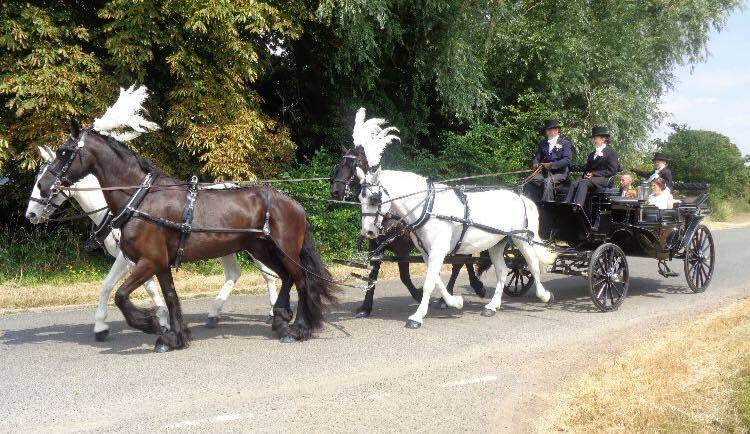 Our horse-drawn carriages are available to hire for weddings, funerals, proms and any occasion you can imagine, including birthdays and anniversaries. 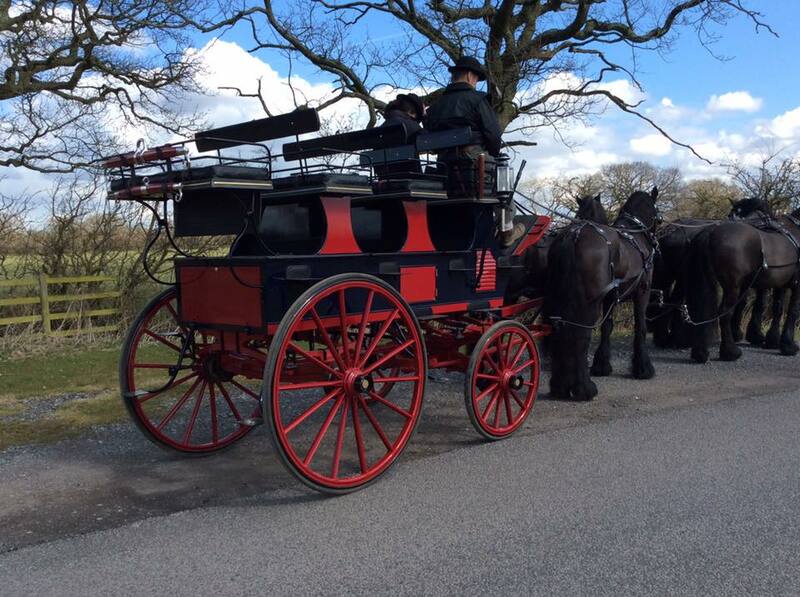 We have a large selection of carriages available, all of which are drawn by our team of beautiful horses and driven by our fully-qualified coachmen. If you would like more information or to discuss your event further, please get in touch via 08454379820. The passing of a loved one is time of hardship for the family and we understand that you want to give them the best send-off possible. 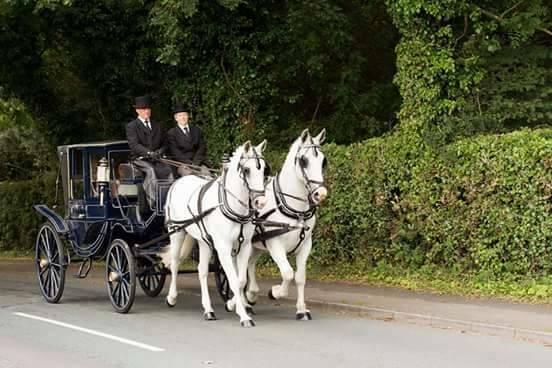 Elegant Carriages have many years of experience working with local funeral directors to provide a traditional horse-drawn hearse across the North West, travelling further if required. Our fleet of hearses are available in four colours: white, black, silver or rainbow. they are pulled by either a pair, team of 4 or 6 of our highly experienced horses- either exclusively white Irish Sport or black Friesians. Alternatively, you can have a "domino" pair which is a mixture of the two. 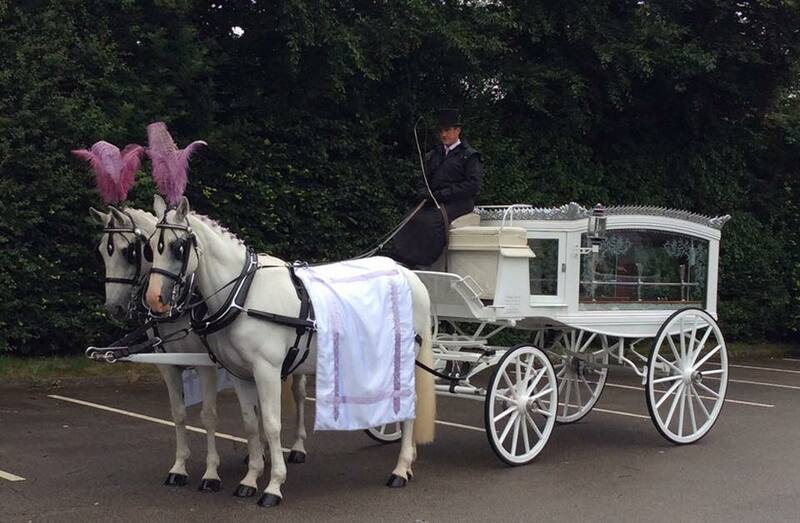 Likewise with our wedding carriages, our hearse carriages are purpose-built with the highest quality material. 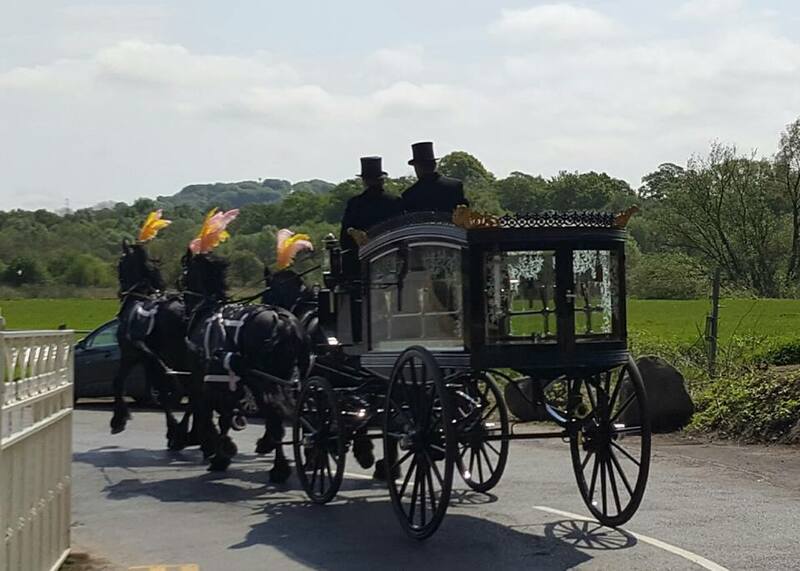 Aside from the hearse carriage, we can provide up to two additional mourner's carriages which are available in two colours and each seats up to 5 people. 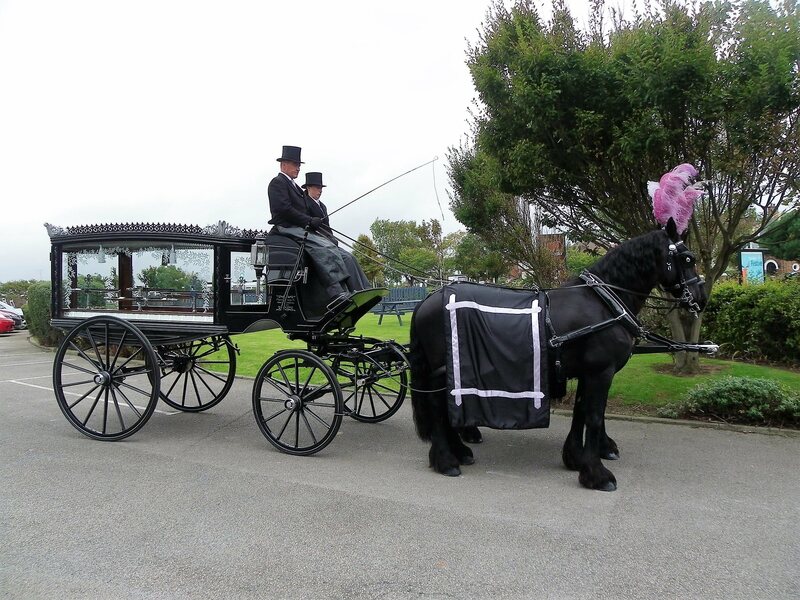 Each carriage can be decorated with flowers to match the theme of your funeral. Our horses are exquisitely turned out with matching drape and plumes available from our collection of over 100 styles. If required, we can provide bespoke drape patterns such as country flags and football club flags. As all drapes are manufactured in house, we can cater to almost request with sufficient notice- please simply get in touch to discuss your requirements. The hire is inclusive of our fully-qualified coachmen who will be smartly dressed in formal attire; they have a wealth of experience to make the day run as smoothly as possible. If required, we can also provide an outrider to accompany the procession. 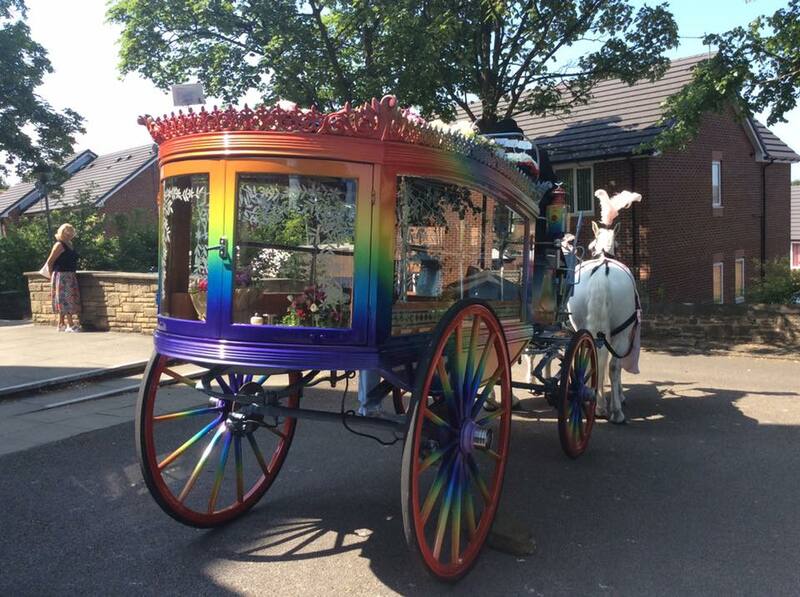 Elegant Carriages are proud to introduce the World’s only horse-drawn Rainbow Hearse- a brilliantly coloured funeral hearse for those who are after something unique to represent the personalities of a loved one who passed. Built for purpose and beautifully decorated by our team, this hearse is ideal to pair with our matching rainbow drapes and plumes for the perfect send-off. It is of course every girl's dream to have a fairy-tale wedding and Elegant Carriages think that every girl should get what they want on their wedding day. Even though we now have luxury cars available, there are little more romantic and elegant ways to arriving at your big day than in a traditional horse-drawn carriage. After all, fairy-tale princesses don't arrive in Lamborghinis. We have a fleet of landau carriages in a variety of colours; each can be decorated as part of the hire to complement the theme of your wedding. Regardless of religion and culture, weddings are joyous celebrations which deserves special attention. Our fleet of carriages are suitable for weddings of all cultures and fully customisable to the theme of your choice. The decorations can be provided by yourself or sourced on your behalf. Our purpose-built landaus feature a stylish convertible roof which can be opened to take advantage of the weather. The carriages are spacious enough to sit up to 5 people (or 2 including the wedding dress!). 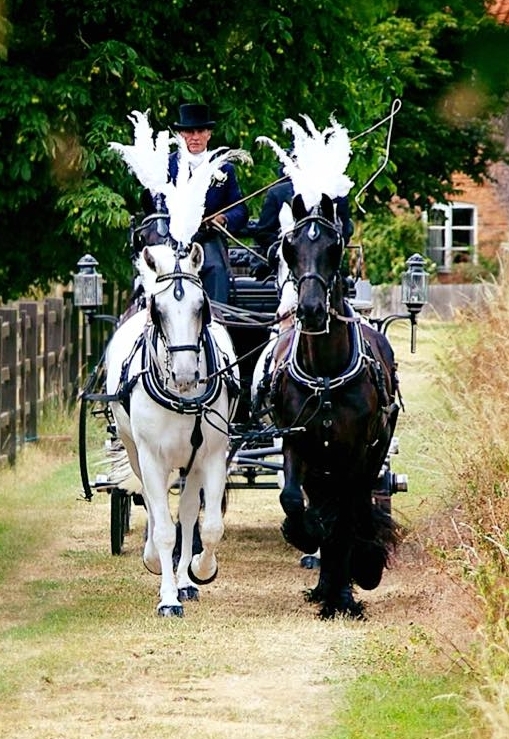 The carriage is pulled by either single or double pairs of our gentle, highly-trained horses. We have 2 colours of horses available- white Irish Sport horses and black Friesians who are dressed immaculately to your colour scheme. We have the North West's largest collection of plumes to choose from- and if you don't find a colour you like, they can be ordered to ensure a perfect match. The horses have plenty of experience, including navigating heavy traffic and busy street, so you have one less thing to worry about on your big day. 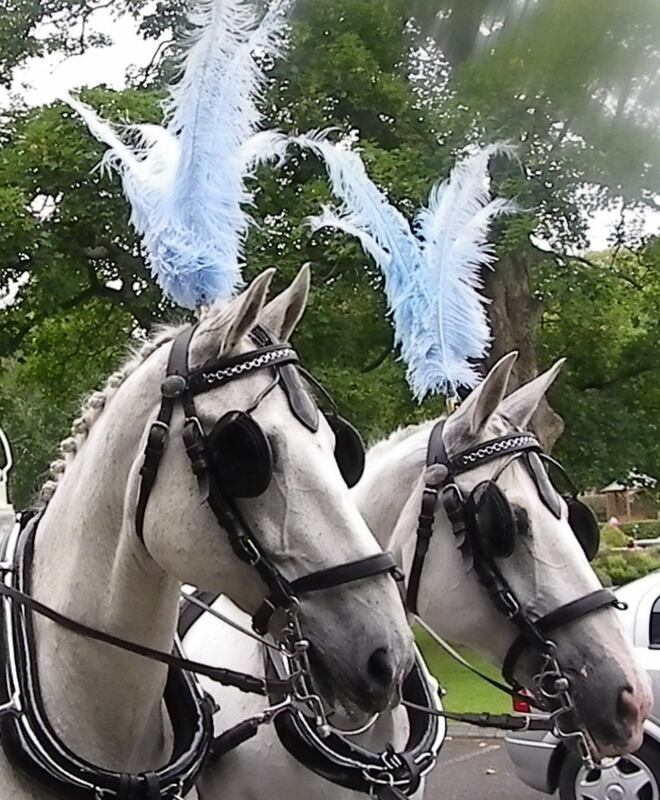 The carriage hire will include our fully-qualified coachmen who will be dressed in formal attire inclusive of top hats. The coachmen, horses and carriage can be featured as part of the photography. 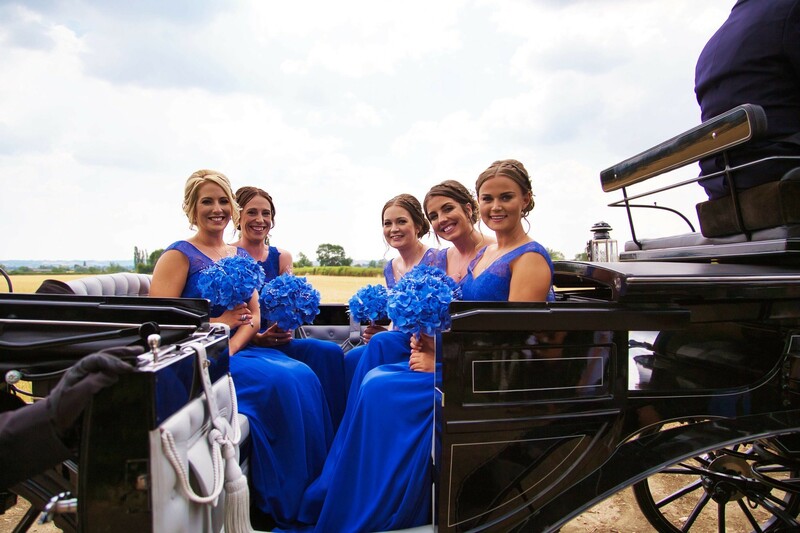 For more information on our carriages or to discuss how we can help you arrive in style on your special day, please simply get in touch via 08454 379 820 or use the contact form to forward your enquiry. In addition to our Landau carriages, we additionally have a navy blue Victoria carriage (seats 2) which can be hired for special occasions such as weddings, birthdays and anniversaries. For those with a larger party, our Roof Seat Brake can comfortably carry 8 people for an outing; it is ideal for pub crawls round the beautiful Lancashire countryside (or further a field), it even features a small private bar! Elegant Carriages are proud to be a local, family-run company with customer satisfaction at the heart of our business. Over the years we have established an excellent reputation for our competitive prices, friendly service and attention to detail. From our main office in Chorley, we can service clients across the North West including Lancashire, Cheshire and Merseyside, although we can travel to all areas of UK if required. As no two events are the same, neither are our prices. Although we can provide an estimated price for our services, we prefer to discuss your event in detail to provide a bespoke quote tailored to your requirements. 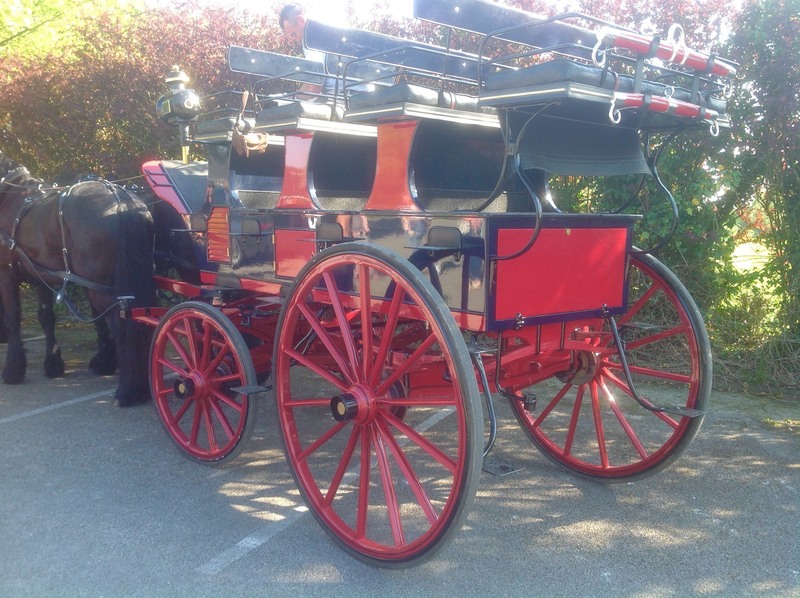 Each carriage is carefully cleaned and inspected prior to your event; subject to availability, we can provide a horse-drawn carriage hire with short notice and no compromise to the quality. You are more than welcome to visit our office on the farm (ideal if you'd like to meet the horses in person) or we can speak in detail over telephone or an exchange of e-mails. Please call us on 08454 379 820 or use our contact form to forward your enquiry and a member of our friendly and knowledgeable team will be in touch as soon as possible.